Character Clubs offers an opportunity for kids of all ages to learn and demonstrate six character traits: Respect, Responsibility, Perseverance, Teamwork, Kindness and Integrity. We teach these traits at Character Camps, which are held during the summer and throughout the school year. 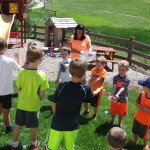 Character Clubs are taught by certified Character Coaches who guide children through the curriculum. 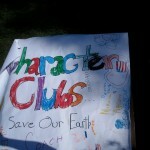 Character Clubs has launched its certification program, and we’re looking for new students! The Character Coach certification program gives you everything you need to plan, market and host Character Camps in your area. To become certified, you’ll learn the six essential character traits and how to communicate them to each age group. You’ll get ideas for service projects and activities, and through each curriculum phase, you’ll create lesson plans that you can use during camps. This program will teach you everything you need to know to successfully run a camp. Once you are certified, you can host your own Character Camps. We’ll support you with marketing materials and ideas, supplies and enrollment services. All you have to do is find a location and recruit students! You can plan and host camps whenever it’s convenient for you and in a way that fits into your own lifestyle. This program is the perfect way to earn extra income while keeping a flexible schedule. If this is you or someone you know, please contact us at DeAnne@characterclubs.com! We would love the opportunity to talk about the program with you and show you how becoming a Character Coach might be just what you need to re-connect with your creative side, engage in meaningful interactions with children and light a fire under your entrepreneurial spirit! Top Ten Movies to Teach Integrity! Integrity: Is it possible to have integrity with others if you don’t have it with yourself? Fun Movies to watch with your kids to teach Perseverance! Top 10 books about the importance of Teamwork!